Don't underestimate the power of salad dressing! This past week I've been cooking from my pantry in an effort to use up the random ingredients I have before we move. Tonight's dinner highlights how salad dressing can dress up more than your favorite salad. With an almost full bottle of balsamic salad dressing sitting in my fridge door, I used it as a marinade for chicken thighs. The dressing itself is loaded with flavor and for good measure, I added a bit more balsamic vinegar with the dressing. The addition of the balsamic vinegar also gave the chicken a beautiful rich color as well. I allowed the chicken to marinade overnight to really absorb the flavors but if you can't wait that long, you can marinate the chicken for at least 30 minutes. 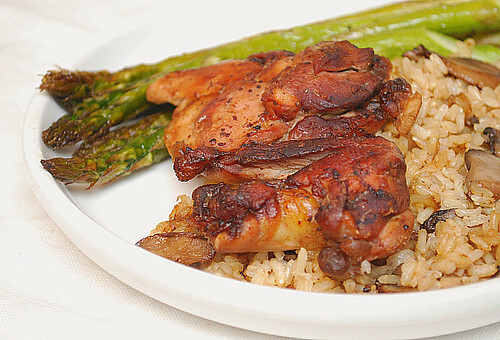 To accompany this flavorful chicken, I served it up with roasted asparagus and a Mushroom Rice Pilaf (recipe follows). The pilaf recipe is a cheater recipe of sorts. In fact, it may even be more appropriate to refer to the dish as a fried rice instead of a pilaf. I prepared brown rice and allowed it to cool. After sauteing garlic, onions and sliced cremini mushrooms, I added the cooled rice and sauteed until the rice heated up and absorbed the flavors of the garlic, onions and mushroom. Place your chicken in a shallow baking dish and cover with the salad dressing and balsamic vinegar. Toss the chicken to coat. Cover with plastic wrap and chill overnight or for at least 30 minutes. Line your baking sheet with heavy duty foil and place the marinated chicken onto the baking sheet, leaving behind the marinade. Discard marinade. Bake the chicken in the preheated oven for 20-25 minutes or until chicken juices run clear and is thoroughly cooked. Saute garlic and onion in oil over medium heat in a large saute pan until softened and fragrant. Add the sliced mushrooms to the pan and cook until mushrooms caramelized. Add the cold rice by crumbling it into the pan and saute until rice is hot, about 5-7 minutes. Season with garlic powder and add salt and pepper to taste. Ohmigosh. This looks SO good! Are the chicken thighs skinless?